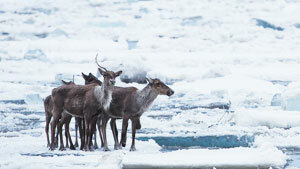 The Arctic is getting a lot of attention these days. Sea ice in the region was at a record low this winter for the third straight year, according to scientists at the National Aeronautics and Space Administration (NASA) and the National Snow and Ice Data Center in Colorado. So governments around the world are more concerned than ever with monitoring and assessing the Arctic's environmental challenges, resource potential, sea transport, and sovereignty. These issues are primarily pan-Arctic, and addressing them often requires international collaboration. 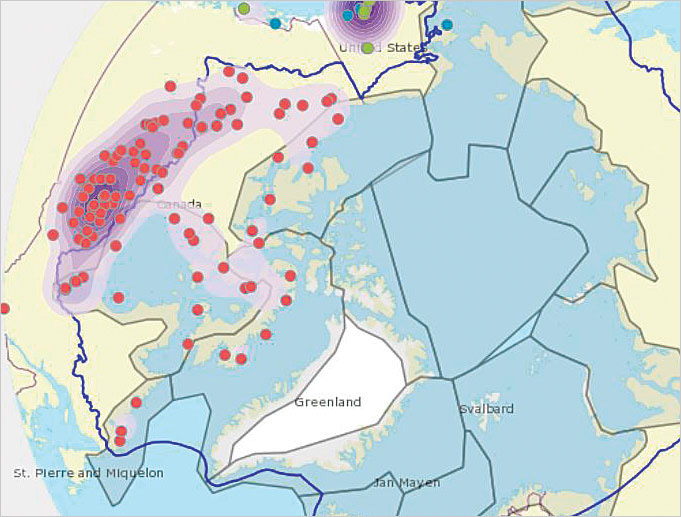 Esri Geoportal Server lets users discover and apply geospatial resources—including datasets, images, and web services—in the Arctic and across the globe. The Arctic Council, a high-level intergovernmental forum that promotes cooperation among Canada, Denmark, Finland, Iceland, Norway, Russia, Sweden, and the United States, plus local indigenous communities, is a leading organization for action on Arctic issues. To improve pan-Arctic decision-making through enhanced geospatial data sharing, the council initiated the development of a spatial data infrastructure (SDI) for the Arctic in 2009. 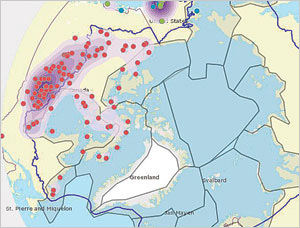 A voluntary cooperation among the eight Arctic countries' national mapping agencies—including the United States Geological Survey (USGS) and Natural Resources Canada (NRCan)—the Arctic SDI seeks to give politicians, governments, policy makers, scientists, and private enterprises access to reliable and interoperable geospatial data, tools, and services. In 2015, to support the strategic goals of the Arctic SDI, the USGS and NRCan began the Arctic Spatial Data Pilot (Arctic SDP) project, which demonstrates the advantages of enhanced data sharing. The pilot project, managed by the Open Geospatial Consortium (OGC), was completed in early 2017. Esri Canada was significantly involved in the Arctic SDP project, which was designed to exhibit the value of interoperability standards by demonstrating how different systems can be integrated when they connect to geospatial web services and data repositories. After the project sponsors decided to focus on policy issues related to Arctic food security, Esri Canada developed a demonstration app that would serve as a "policy workbench" for examining Arctic food security issues. The demonstration Policy Workbench app, built by Esri Canada, presents an array of information, including background on food security and instructions on how to find data, reference maps, and Landsat imagery. Because policy analysis, development, and monitoring require input by and communication among many policy makers, Esri Canada decided that a shareable web mapping app would be used as the technology behind the Policy Workbench. This would allow policy makers to use a single tool to view, analyze, and share maps and data. Esri Story Maps apps, available in ArcGIS Online, were selected as the best solution to meet the requirements of having a comprehensive, one-stop, simple-to-use, multiparticipant app for Arctic policy makers. Esri Canada chose the Esri Story Map Series app template in a tabbed layout to clearly present various types of information. With the story map, a policy maker could look for information related to polar bears, for example. 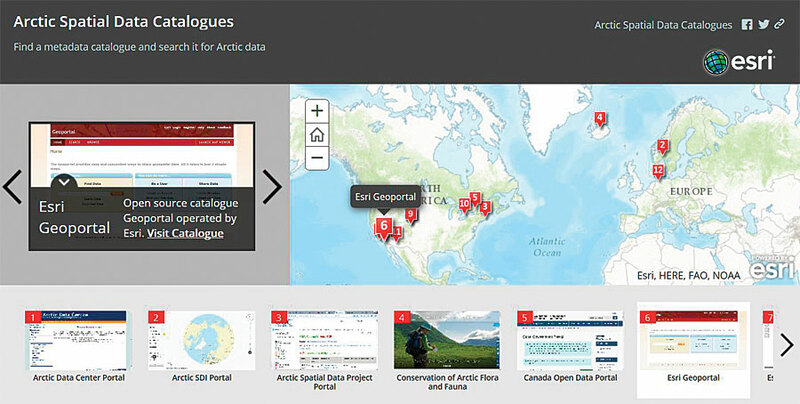 To find and view geospatial data, the policy maker would go to the Find Data tab; select a catalog search site, such as Esri Geoportal Server, and run it outside the story map in ArcGIS Online; search for the term "polar bear"; and examine the results. Once the policy maker selects a dataset, he or she can copy the service URL from the catalog site and paste it into the Add Web Layer box in ArcGIS Online. With the data loaded, the policy maker can examine the polar bear data in relation to other Arctic spatial data. The Policy Workbench has maps that show where store-bought food is available in Arctic regions. The Policy Workbench also provides users with immediate and dynamic access to Esri's massive Landsat imagery services collection, which contains more than 30 years of Landsat satellite imagery. The demonstration app interacts with Landsat services using the ArcGIS REST API, which makes it easy for peers to exchange information in a decentralized, distributed environment. Policy makers can also load their own map services on top of the Landsat base image to provide further context. Additionally, the Policy Workbench gives users instant access to the ArcticDEM using the OGC Web Map Service (WMS) standard. This high-resolution, high-quality digital elevation model (DEM) of the Arctic is being produced through a public-private initiative between US and Canadian government agencies, the University of Minnesota's Polar Geospatial Center, and Esri. National mapping agencies from the eight Arctic countries, including the Canada Centre for Mapping and Earth Observation at NRCan, are providing sustainable support for the Arctic DEM initiative by making continuous improvements to the data. The hillshade, slope, and aspect models that are part of the DEM and thus available in the workbench have proved very useful for making policy decisions, since they show, for example, the rugged and steep areas where caribou (an important food source in the Arctic) are unlikely to be located. Humans in the Arctic have had a longstanding dependence on caribou, which have served as an important source for food, clothing, shelter, and more. Food security has complex policy implications. That is why the Policy Workbench has maps that show the different aspects of store-bought food, including the locations of major retail food stores, the spatial density of these food stores, transportation routes, and local language areas. These data layers can give policy makers some indication about the propensity of the population in various areas to purchase store-bought food. If people in a certain region do not have access to store-bought food, they may rely on what's called country food, meaning they regularly engage in hunting, fishing, and gathering. Those who harvest country food can be significantly affected by animal populations, pollution, ice melt, and other issues. However, the country food section of the Policy Workbench currently only provides demonstration information on a fraction of what affects country food, such as land cover and where hunting, fishing, and gathering are not allowed. Food security, or food scarcity, is often a localized issue that affects only certain areas. The Policy Workbench demonstrates how integrating local large-scale map data with available smaller-scale map data can aid in examining food security policy issues. As the Policy Workbench demonstrates, mapping technology and web services are immensely helpful for informing policy decisions in a place as large, diverse, and critical as the Arctic. The workbench also aids both the United States and Canada in achieving their domestic objectives for open data standards and interoperability. It is imperative that the information coming from various governments, companies, nonprofits, and communities can work together, which is why the Arctic SDP project was so pivotal. "The [Arctic SDP] project will ensure that the facts we collect in their data formats are interoperable and can be shared from local to global partners in a seamless way," explained Prashant Shukle, the director general of the Canada Centre for Mapping and Earth Observation at NRCan. "To date, there has been no such effort to do this, and this project is, for the Arctic, a game changer." To learn more about the Policy Workbench, read the Esri Canada blog post, "How can an SDI be used for policy decision-making in the Arctic?" or contact Gordon Plunkett, Esri Canada's director of SDI.